The miniature pine cones I collected over the weekend have been sorted and are now on display in the pottery bowl I bought from Taos Pueblo. And, it got me thinking about where I got my outdoor goods collecting tendencies from: Mom. (I remember the husband and I once going on a long walk in town and I collected a “bouquet” of bird feathers along the way that I took home and presented to the cat. She thought it was pretty cool). My Mom has been a rock collector as long as I can remember. Whenever we went camping the bed of the truck, as we drove about the countryside far and wide, was littered with kids…and rocks. This is back when none of us thought anything about riding in the back of a truck, so no hating on the parents. Sometimes Mom would spot a primo specimen from the truck and we’d come to a screeching halt so she could examine it more closely. Other times we would be out for a walk and she would find something to lug back to camp. Quartz was a popular choice. Most of Mom’s rocks were fist sized or bigger. There were a few as big as my head. 🙂 She used them to line her flower beds at home. The Cocker Spaniel we grew up with, Carmel, was a rock dog (rather ironic, isn’t it?) That dog would drag rocks all over the place, and she had a fondness for the rocks lining Mom’s flower beds. Yes, they were bigger than what you think a Cocker could drag around, but that dog had some strong neck muscles. Mom would be out weeding and you’d hear her yell at the dog, “Drop that! Drop that!! That’s mine!” When my parents sold the house and built a new one Mom packed up all of her rocks in 5-gallon buckets and moved them. They have now lined flower beds at the “new” house for 20+ years. Lucky for Mom, the two dogs after Carmel have not been rock dogs, so her rocks are left undisturbed. 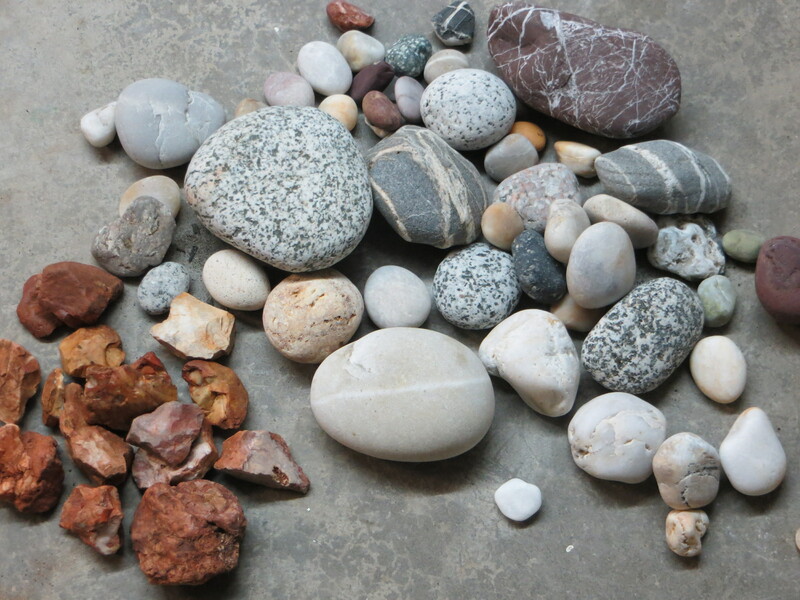 I used to think Mom’s rock collecting tendencies were….well, weird. Rocks? Why rocks? And then, somewhere along the line, I started doing it myself. 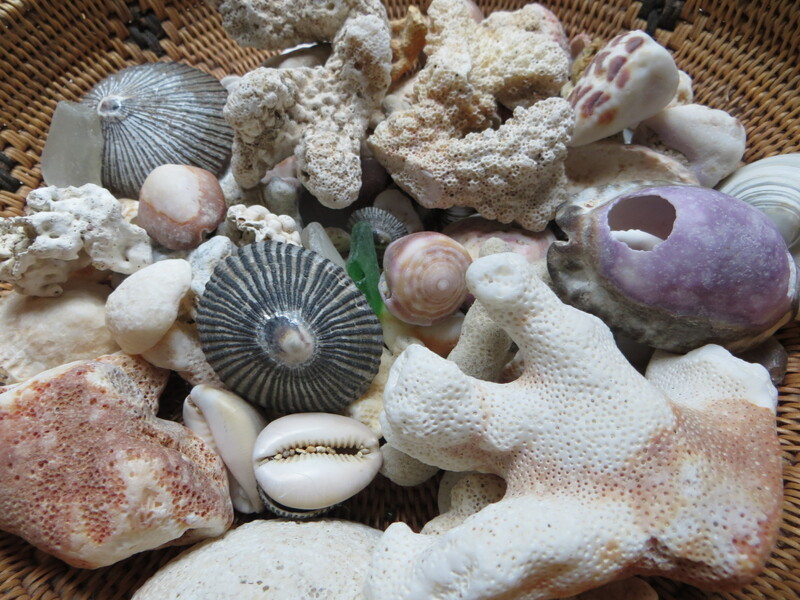 I think it started with beach combing on Hawaiian islands (I know, you’re not supposed to bring things home. I know, there’s supposed to be some sort of curse if you do). 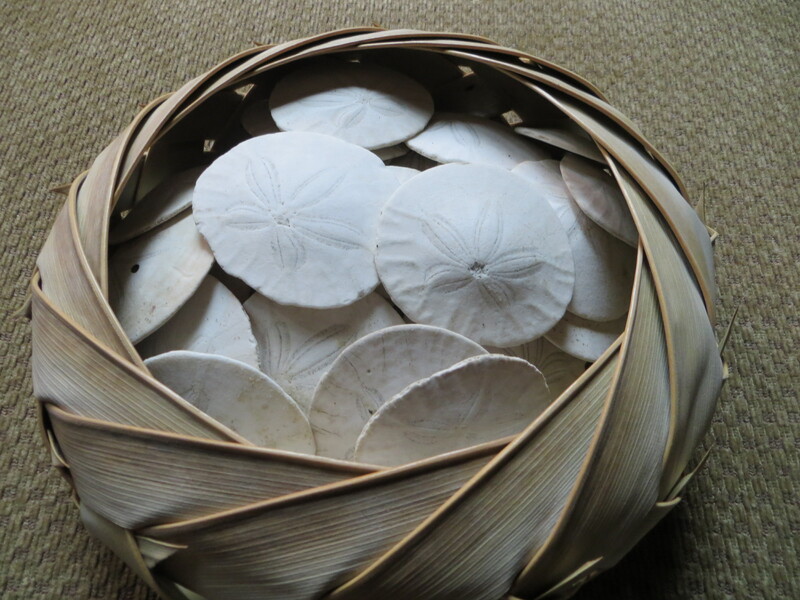 One trip I bought a basket from an open-air market, and that’s where my Hawaiian treasures reside. 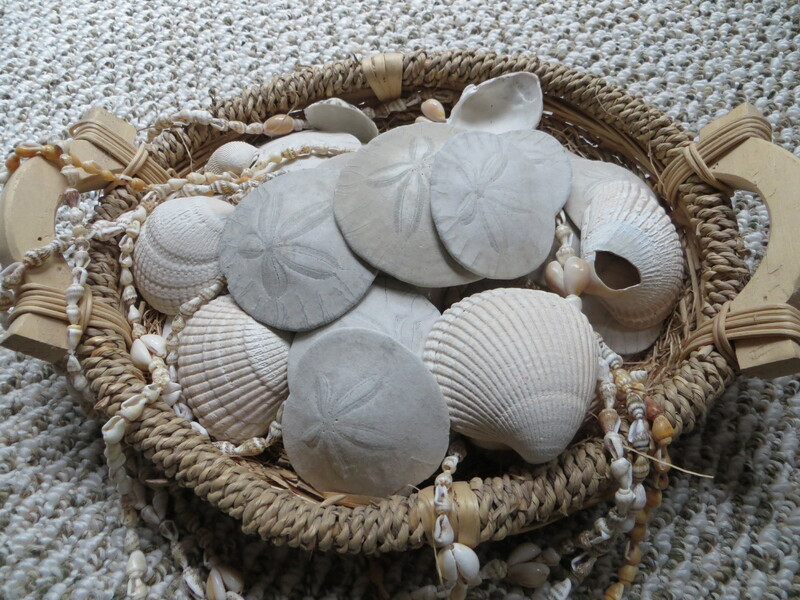 I’ve also gathered a great many sand dollars from the Washington coastline. I’m partial to the Oregon coast. In my opinion it’s much prettier than the flat Washington coastline. And, it’s an absolute shame that vehicles are allowed on the beach. It’s tough to take a walk and enjoy the scenery and the sound of the ocean if you’re dodging vehicles. The only part the Washington coast that I’ve found rivals Oregon is the Northwest. Now that’s a special area. The only truly redeeming part of the Washington coastline (think Longbeach, Ocean Shores) is that the lack of off-shore rocks makes for primo sand dollar territory. They don’t get smashed and broken off shore. And then there’s the assortment of rocks in the garage. Some from beaches, somefrom hikes (the husband doesn’t like it when I pick up rocks while hiking. He says if I want them I have to haul them myself). The red ones I picked up on on hikes in Sedona a year-and-a-half ago. Through my experiences gathering rocks and shells I’ve figured out (I think) why Mom did it when I was a kid (and is still known to bring home a rock or two). Sure, it’s a pretty rock thing, but it’s also a memory thing. There are memories and stories associated with the rocks and shells that I’ve picked up. That’s how rocks came to be one of my favorite souvenirs. Thanks, Mom. How long have you had your little palm basket from Hawaii? We have one just like it that a local made while we stood there talking with him. We were supposed to soak it in ocean water before we left the island, to make it last for a long time, we didn’t but it’s still nice and tight after five years and occupies a special place on the living room bookshelf.